This Virginia creeper clad Georgian House overlooks the Newport River in Co. Mayo. What a joy it is to actually get to stay here when the foliage is turning into its annual autumnal red glow. The estate dates back to the late 1800’s when it belonged to the O’Donel Clan, known for their ferocity on the battle field. 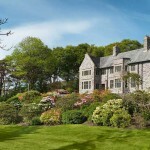 The current owner Kieran Thompson purchased Newport House in 1985 and his ethos since then has been that of a Custodian in ensuring that Newport House maintains its authentic traditions and yet provides modern comfort and understated luxury to its guests, many of whom are regular visitors. Newport is a resplendent House, all the more attractive for keeping to its bona fides. It has played host to the fishing fraternity, amateurs and experts, since the early part of the 20th century. Very little has changed in the internal layout of the House since that time. There are 10 well appointed and comfortable guest bedrooms in Newport House. Situated right in the heart of the village of Newport the House is tucked away discreetly for such a notable building. 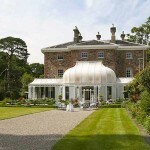 Newport House has played host to many well known celebrities since it opened its doors as a Country House. Princess Grace paid a visit and more recently her son Prince Albert and his lovely new wife came to pay homage to their roots. Newport is the area where the Kelly homestead is located before they had to emigrate to the U.S. along with thousands of other Irish migrants. The House: Entering the House on the left side of the square front Hall is a typically symmetrical Georgian Drawing Room with two large bay windows and walls covered in Regency striped wallpaper. The room is furnished with appropriate antique chairs, occasional tables, portraits good enough to be in the National Gallery and sofas covered in Linen Union. The room gives guests a sense of understated elegance rather than the more popular ‘bling’ prevalent in many restored Country Houses. On the opposite side of the front Hall is a smaller but equally comfortable Sitting Room; both rooms have real fires and there is nothing more satisfying that throwing some lose turf and logs on to a real fire. Coffee is served in monogrammed Wedgewood china, as befitting such a gracious House. The main Hall behind the front one is truly magnificent with a stylish sweeping staircase. Despite being a central room it is extremely bright with light streaming down from a huge raised Lantern high above the stairwell. The fishing theme is very evident throughout the House and in particular in this Hall where there are several specimen fish mounted in glass cases, including a huge salmon weighing over 20 lbs caught during the 1990’s and a really huge (and seriously ugly) Pike caught in 1920. It must have been some battle to land a fish this size. To the back of this magnificent Hall is yet another glass case with a vicious looking badger who has just caught a fish. The feeling is that of being in time warp and one feels it could be an excellent location for an episode from a period series such as Foyle’s War. Behind the smaller Sitting Room is a delightful tiny Bar, furnished with a ‘fishy’ theme and mahogany and leather chairs. Suffice to say that the prints on the wall deserve special attention and mention for their risqué animal subjects. Rumour has it that the present owner was not allowed to remove them by the ‘regulars’. The Bedroom: I was allocated a bedroom facing to the front of the House overlooking the tidal Newport River. With bowed windows looking out at the river it was an indulgent and picturesque view; a gentle wind blowing the leaves of the Virginia creeper that surrounded the windows. Both the bedroom and bathroom were spacious and spotlessly clean. The bed was dressed in traditional style with blankets and a flowery linen cover in keeping with the linen manufacturing tradition of the village of Newport. Modern technology was present with the addition of a flat screen television and WIFI access. Fishing at Newport House: Fishing records go back many decades and make for interesting reading. There are several record books to browse through. One of the books dating back from the 1940’s show that visitors then were mainly Irish, British, French and American. I noted in the most recent book that a fly called Jonah Lomu has been used to catch a salmon. I thought this was quite fascinating and when I asked Eamonn, the Fishery Manager, about how the fly was named after the KIWI rugby player, he promptly gave me a gift of a Jonah Lomu, along with two more traditional flies; the Beltra Badger and the Jaffa. I have now carefully mounted them as a display but should I have the opportunity to go fly fishing I will certainly be using them and hopefully catching a large salmon. Cuisine: The Dining Room in Newport House is a good size room with a crescent shaped wall on one end. The walls are covered with interesting portraits of gentlemen and ladies from the 19th century, some of whom were handsome in their day but one particular lady apparently needing a shave! There is a massive tall cut glass antique chandelier overhanging the centre of the room which positively sparkles in what could otherwise be construed as a sombre room with its leather chairs. The Menu is cleverly devised with good variety of choices. My starter was a delicious asparagus with blue cheese; guinea fowl for the main course was perfectly cooked in a very fine jus. I did indulge in a rhubarb tartlet for dessert with only a little persuasion. The cuisine in Newport is very much country house cooking at its finest, with Chef John Gavin presiding over the kitchen since 1983. Catherine Flynn who looks after the front of house has also been in Newport House since the early 1980’s. Catherine is probably Newport’s greatest asset and her genuine kindness to guests is tangible. She remembers all the guests who have passed through the doors. It is a rare but welcomingly warm and pleasant feeling to be greeted as a special guest on arrival. There are plenty of other activities to take guests’ fancy as well as fly fishing. Surfing on the wild Atlantic Ocean is a growing sport. However, it is cycling and walking that has really taken off along the coast of Mayo on the newly created Great Western Greenway. It is the longest off road walking and cycling trail in the country. Starting in Westport the trail weaves its way to Achill Island. Climbing is also very popular with so many mountains to choose from. However, a climb to the top of the famous Croagh Patrick is not just climbing any old mountain as ‘The Reek’ (as it is known colloquially) is regarded as Ireland’s most spiritual mountain and on whose summit St. Patrick fasted for 44 days in 441AD. On leaving Newport House the feeling was that of having visited a Country House that is in total harmony with its local surroundings. So often one hears the phrase ‘a warm welcome awaits you‘ but here in Newport House this is a cast iron guarantee. Newport House, Newport, Co. Mayo.